Simply Stairs is a ‘how to’ book which guides the reader through all aspects of the design and construction of a wide range of timber staircases, step-by-step. It provides anyone with a basic knowledge of woodwork with the know-how and confidence to build this most important of building elements – from start to finish! The author’s philosophy of methodical working, checking and double-checking, avoiding pitfalls and mistakes, and reaping the rewards of producing strong, well-designed staircases which fit beautifully in their intended locations will be appealing to all readers. This is recounted in a relaxed and informal writing style which maintains the reader’s interest. Simply Stairs features the author’s acclaimed ‘Rise & Going Calculator’ – a unique, colourful, and easy-to-read chart which aids stair calculations by eliminating the need for geometry and trigonometry. The book will be indispensable for students of carpentry and joinery, and apprentices for whom stairs remain a vital part of the qualification at all levels, requiring both practical and theoretical knowledge of the subject to be demonstrated. It will be an invaluable teaching handbook for lecturers and provide trades people and professionals with the means to expand their knowledge. Joinery manufacturing companies will find it a useful aide memoire to help them seek an additional revenue source and streamline their existing stair-building operations. Simply Stairs will also become the handbook of choice for those involved with DIY and self-build projects. Quite simply, there is nothing comparable in the market today. 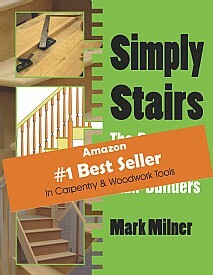 OTHER BOOKS DESCRIBE THE SKILLS, SIMPLY STAIRS DEMONSTRATES THEM. 5. L-Shaped Stairs with Quarter Landing. 6. L-Shaped Stairs with Kite and Winders. 7. Dogleg Stairs with Half-Turn Landing. This will be essential and valuable reading for apprentices and students of carpentry and joinery, their lecturers, trades people, professionals, and anyone interested in woodwork.